AP Departmental Tests Exam dates, Exam Schedule, Hall tickets for Novmeber 2018 Session (Notification No.07/2018): The Departmental Tests, November, 2018 Session (Notification No.07/2018) is scheduled to be held at 13 Districts of Andhra Pradesh from 10-11-2018 to 15-11-2018. Hall Tickets are hosted on Commission’s website for downloading. The Commission has made all the necessary arrangements for the conduct of examination. Candidates will be allowed into the venue after verification of the original Photo ID of the individual i.e., Passport, Pan Card, Voter ID, Aadhar Card, Govt. Employee ID or Driving Licence etc from 8.30 AM to 9.15 AM (with a grace period of 15 minutes up to 9.30 AM) and 1.30 PM to 02.15 PM (with a grace period of 15 minutes up to 02.30 PM). No candidate will be allowed for the examination after expiry of the grace period. Candidates are not allowed to bring any electronic devices such as Mobiles, iPod, Calculators etc. Rough sheets and Pen shall be provided by the centre in-charge to each candidate so that they need not carry any articles with them except authorised Books (Bare Acts only) for those tests prescribed with books. The prohibited articles will not be allowed into centre and in no case in any examination hall. If any candidate is found with prohibited articles, he/she will be instantly debarred from the examination. The check-in procedure inside the test hall includes capturing the image and left thumb print. This is a security feature which will allow APPSC to crosscheck the identity and also to prevent impersonation cases. Therefore candidates are advised to not to apply any external matter like mehandi, ink etc., on their fingers. Candidates shall behave in orderly and disciplined manner and shall not talk with another candidate during examination. They shall also not glance / peep into other Computer. In case of system breakdown / stop up, the candidates needs to be in their respective seats until the systems are restored and examination resume. No candidate is allowed to leave the Examination Hall till the completion of the Examination. The candidate should not adopt agitation tactics in the examination hall such as rising of slogans against the examination staff, instigating other candidates to go out of the examination hall and should not disturb other candidates from writing the examination. The candidates will be liable for punishment as per Regulation PME notified vide G.O.Ns.No.385 G.A (Ser-A) Dept., dt.18/10/2016 for indulging in Malpractice /Misbehavior during the examination. In addition to state that the provisions of A.P. Public Examinations (Prevention of Malpractices and Unfair means) Act, 1997 published in AP. Gazette No. 35, Part-IV ‘B’ Extraordinary, dt.21/8/1997 will be invoked if malpractice and unfair means are noticed at any stage. The scribe accompanying eligible disabled candidates shall bring Original Photo ID. Pregnant / blind / OH candidates will be accommodated at Ground Floor. For any assistance, the candidate may contact No.8498098264 and 8498098292 from 09:00 am to 05:00 pm on all working days. 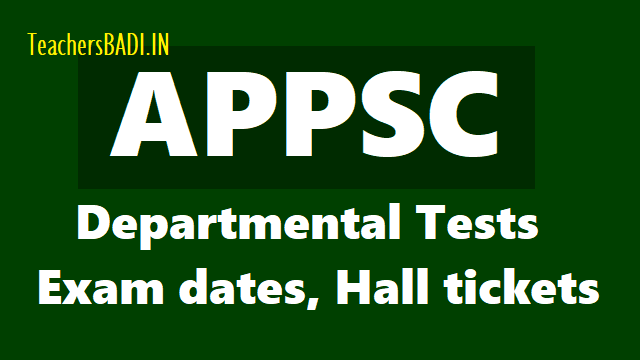 The Hall Tickets for Departmental Test May, 2018 session to be held from 07/06/2018 to 12/06/2018 are hosted on Commission’s website for downloading from 30/05/2018 till last date of examinations. The candidates shall download the Hall Tickets along with the guidelines and instructions to the candidates and report one and half hour before the commencement of the test with proper ID proof in original for admission to the tests.